It always happens when you least expect it. After just an hour walking with the dog in the pouring rain last week, I peel off my expensive waterproof jacket to find I was soaked through. What had gone wrong? Then I realise I hadn’t washed and reproofed it for ages. If you’ve made a significant outlay and invested in a great technical, waterproof jacket, you probably need to consider that, like any investment, you may need to spend a small amount of time maintaining its performance properties. It might be a chore, but it’s worth it to know that the jacket/trousers will keep you dry out on the hill in all weathers. Failure is inconvenient when out with the dog for an hour, but potentially dangerous on a multi -day hike in the mountains! You need to wash the garment removing the sweat, grime and dirt first and then reproof it. There are many wash and reproofing products on the market but Nikwax and Grangers are the most commonly available in the UK. How often do you need to wash and reproof? This all depends on how often you are using the gear and for how long. If you are just using it the occasional weekend and odd hiking trips a rough rule of thumb is once a year minimum. If you’re working hard, trail running, climbing, mountain biking or paddling on a regular basis, then you’ll need to do it 3 or 4 times a year. The build-up of grime and sweat inhibit the ability for the material to breathe, which in turn makes the inside of your jacket clammy. Dirt and wear and tear deplete the DWR (Durable water repellent) coating externally. Detergent attracts water, which is the very last thing you want for a waterproof jacket! So you need to thoroughly wash out the dispensing draw in your washing machine first. You could also run a clear cycle through with no detergent to ensure there are no traces of it. You will know if you need to reproof it as well, as water will not bead on the surface of the garment but soak in to the DWR which is the mid-layer of most jackets. It will also look darker in colour. You do not have to reproof every time you wash, however people often do both to be sure. 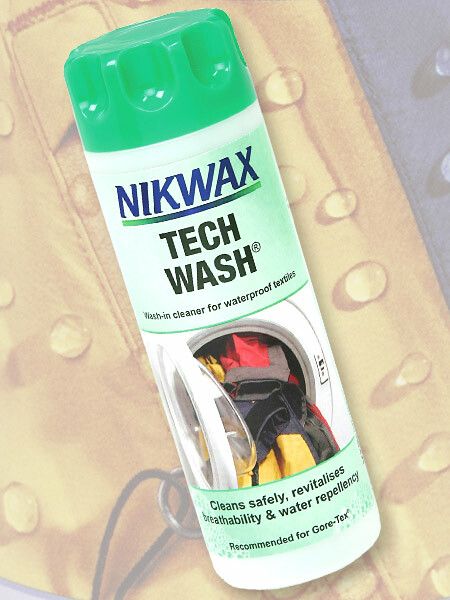 This is a useful product if you are caught out on a trip when a jacket or tent fails. It is an instant fix until you can get home to do a proper job using the washing machine. Place your wet garment flat out on newspaper or something else to protect the surface beneath, alternatively place the jacket on a hanger. You can also buy products that wash and reproof in one go but we have never tried them so can’t comment on how effective they might be. On a side note, traditionally DWR products have been used in this process but the Outdoors Industry is looking for alternatives, as it has been found that the PFC (Perfluorochemicals) based water repellents are not that environmentally friendly. As you can see it is a straight forward process but one worth setting time aside for, as it will ensure your gear, which you have invested in, is up to the job of keeping you dry and comfortable outdoors for a long time to come!